I was over at my neighbor Angela’s house for dinner a few weeks ago and one of the dinner guests brought over some olive tapenade crostini as a starter. It was so tasty that I went out and got a jar for myself. I know I could have made it at home but I was lazy (what else is new?). So instead of making a crostini out of it, I threw it into my dinner. This pasta dish really has a ton of flavors. 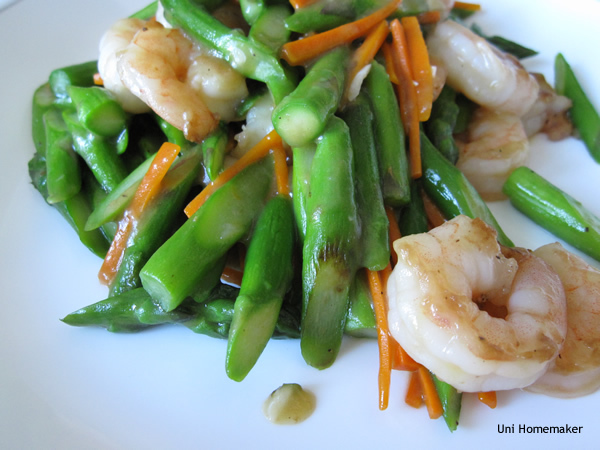 You can easily leave out the shrimp to make it vegetarian friendly. Leftovers are awesome the next day for lunch! 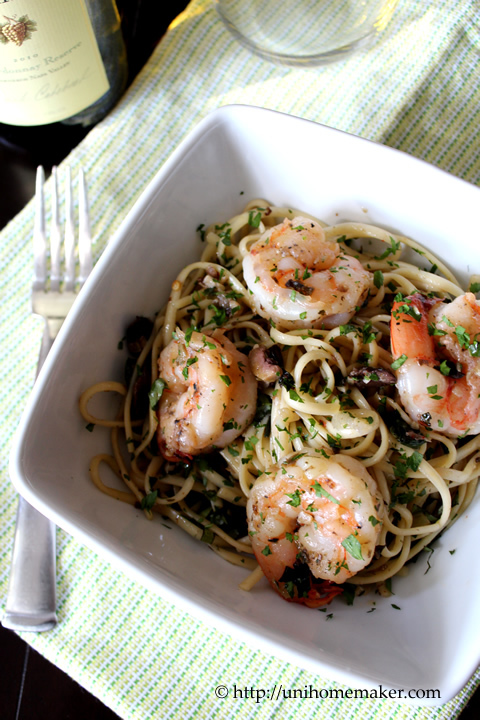 If you’re a fan of olives, you’ll love this. Enjoy your week. 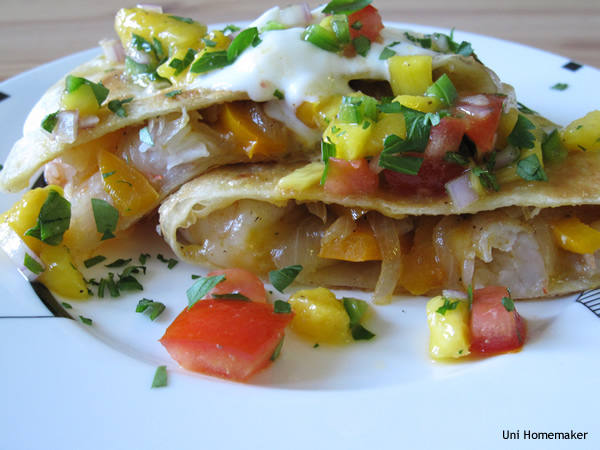 This recipe was inspired by Massi of Massi’s Kitchen. 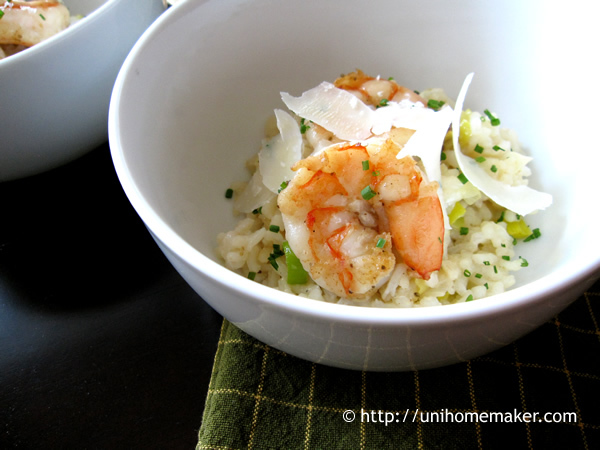 Massi did a post on Risotto agli Scampi al profumo di Prosecco in December using Prosecco and shrimp in his risotto dish. I have never cooked using Prosecco so I thought it would be interesting to try. Not only was it delicious, it looked beautiful and elegant to serve to company. So if you haven’t gone over to Massi’s Kitchen, take a look at some of his divine recipes! Yesterday was Kimi’s birthday so I thought this would be the perfect dish to serve as a main course. As the appetizer course, I served a Spicy Tuna Poke Crostini which I will post at another time. Everyone seemed to enjoy the food and went home with a happy belly. 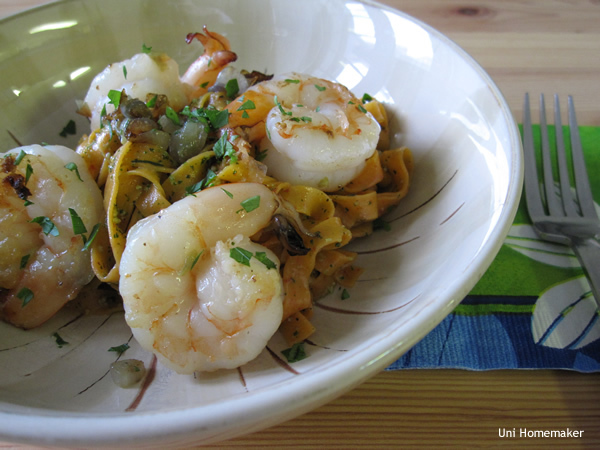 So if you are looking for a dish on those special occasions, this would be good one to make. Happy Birthday Kimi! This is the second time I have made pesto sauce from scratch. It tastes so much different than the stuff you get at the store. When you make it at home, there’s that taste of freshness that you don’t get with store bought pesto. I highly recommend making it yourself if you have the time. I was feeling a bit lazy today and didn’t want to go through a lot of trouble cooking dinner tonight. Since I had some asparagus and defrosted shrimp, I thought I’d combine the two. I also had some carrots so I threw that in. Took no time at all —I was done cooking within 45 minutes.